Iggy is ready to move on. 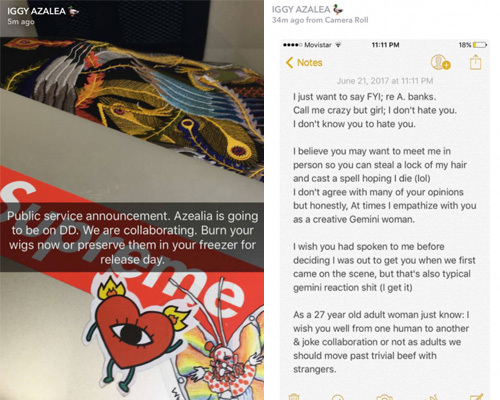 Iggy Azalea has surprised fans by announcing that she plans to collaborate with her arch enemy Azealia Banks on her new album. The ‘Fancy’ rapper revealed the news to her shocked fans via Snapchat. “Public service announcement. Azealia is going to be on DD. We are collaborating. Following the controversial announcement, Iggy attempted to defend her actions on Twitter. “This has been something extremely negative for so long,” she said. If you cant understand my desire to turn YEARS worth of negativity into a positive interaction then thats your loss my dear. peace! In response to Iggy’s statement, Azealia told XXL that she would be open to having an open discussion with her. “I think a true reconciliation can happen once there is some acknowledgment of what hip-hop has been trying to tell her,” she said. “I still don’t think she quite understands the effect her racial privilege and the socio-economic leverage that comes with it has on a marginalized group of women’s culture. She continued: "Race aside, this is also a women’s issue. I hope that there will be a chance for us to have an open discussion about this, as I feel America and the world could really benefit from some candid discourse between two public figures about the world’s biggest sickness: racism. “I wish for women of the future to be able to refer to this moment in women’s culture as an example of what can happen when people take time to understand." Iggy Azalea and Azealia Banks’ new collaboration is expected to appear on the Australian’s much-delayed album ‘Digital Distortion’, which still doesn’t have a release date. Their long-running feud stems back to 2014, following a series of scathing tweets directed at each other.